Although banana trees typically grow in the ground, they thrive in containers, too. Potted banana trees add a tropical accent to patios, porches and small yards. 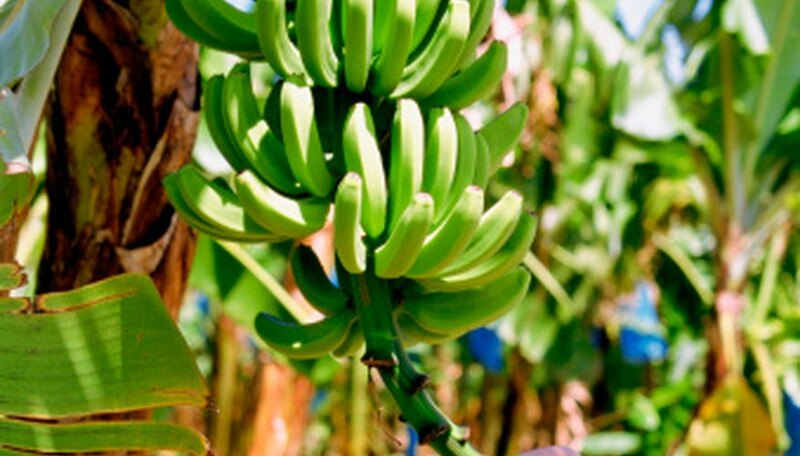 Banana plants need sunlight and warm temperatures to produce fruit. Moisture is also key -- too little and the plants suffer; too much and they'll rot. Grow the banana tree in a container that is deep enough to cover the entire root mass. The pot must have a drainage hole to prevent root rot. It can be made of plastic, ceramic, clay or metal. Put the pot in a location that gets bright sunlight for 12 hours a day. While some bananas grow in slight shade, most need sunlight. The ideal temperature is between 54 and 80 degrees Fahrenheit. Move the tree indoors if the temperature drops below the ideal range in the winter. Put the container in a south-facing window so the plant benefits from the sunlight. Move the pot back outdoors in the summer. Use a well-drained rocky soil mixture. Banana plants grow best in lava rock soil or lava sand, typical of Hawaiian soil. Potting soil for cactus plants can also be used. Do not fill the container with regular potting soil. Place the tree in the pot and cover the root mass with the soil. Press down lightly to remove air pockets. Adding about 20 percent perlite aids drainage. Water the banana tree until it comes out the drainage holes in the bottom. Check the soil moisture often and water when it is dry to a 2-inch depth. Keep the soil moist but not wet. If the tree dries out, it's prone to spider mites and other infestation. Apply a balanced food around the base of the tree during the growing season -- April to September. Balanced fertilizers contain nitrogen, phosphorus and potassium. Use a 8-10-8 (nitrogen, phosphorus, and potassium) fertilizer, and check the soil pH often. Banana trees need a pH of 5.5 to 7. Mature plants need 1 lb. every month and young ones flourish with 1/3 lb. unless the pH needs balancing. Spread the fertilizer out to the edge of the container. Prune banana trees lightly as they grow. Control the shape and size by removing damaged or weak branches, as well as those that cross or rub against each other.